Khaki is by far one of my autumn staple colours and I can feel that this dress is gonna get a fair few outings this season. I spotted this dress online at Yours Clothing and was desperate to try it on. Yours clothes often tend to be rather generous on their sizing, so I went with my safe option of a 20. I am between a size 18/20 usually and in all honesty I could have gone for the 18. The dress has a mock knot detail at the front with ruching all around it to pull in the waist and a panel underneath for modesty I guess. It's made from a light viscose material and has quite a slinky feel to it. It's also advertised as dark khaki in colour but it definately looks more of a grey clay colour to me. 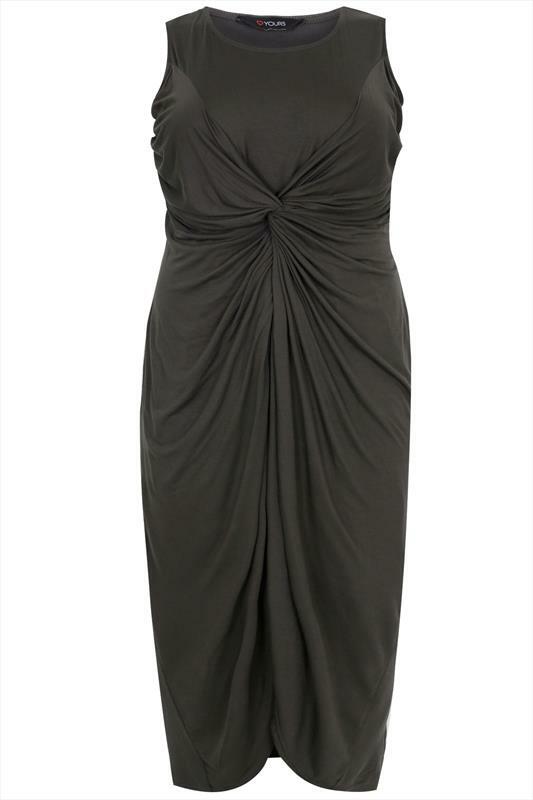 The dress currently retails at £29.00 and you can pick it up online using product code 101121. The dress is available from a size 16 to a 32. If you are aiming for a more fitted look and you're between sizes like me, go for your lower end. The dress is advertised as a maxi, but I'm not sure that's the most accurate description. I'm 5ft 4" and this dress only just met my ankles when I stood up straight, it's also not a full skirt especially with the front panel and split front opening. This dress is more of a midi than a maxi. Overall Summary: Cute dress, super comfy shoes, all round a great combo for late summer evenings or early autumn nights out. You could style this with a statement necklace and perhaps a pair of heeled ankle boots for an evening out. Potential improvements: The dress could be longer as it's advertised as a maxi. Would I recommend this? Yes especially the shoes. They are comfy and versatile and they are available in both black and white - buy both! The dress is quite simple and plain so it's crying out for some statement jewellery, but with that it could be dressed up for a night out or thrown on with converse for a casual day look. .These items were gifted to me for review purposes. The review above is based on my own opinions of the products and I own all creative content of this post.